While there are no major spoilers below, I do discuss the contents of Queen’s Shadow in detail—consider yourself warned. On May 19, 1999, The Phantom Menace opened in theaters. It was the first new theatrical Star Wars movie in sixteen years and kicked off a new trilogy exploring the rise and fall of Anakin Skywalker before he became Darth Vader, a character that had already earned a spot in the pantheon of classic villains. However, rather than opening the movie on Tatooine, where we learn that young Anakin is living as a slave, we instead start on an unknown planet in danger of invasion, ruled by a teenage girl who will do anything to save her people. And yet, despite a whole movie and a handful of tie-in novels that centered around Queen Amidala, she became increasingly sidelined as the trilogy went on and her character became inextricable from her doomed relationship with Anakin. 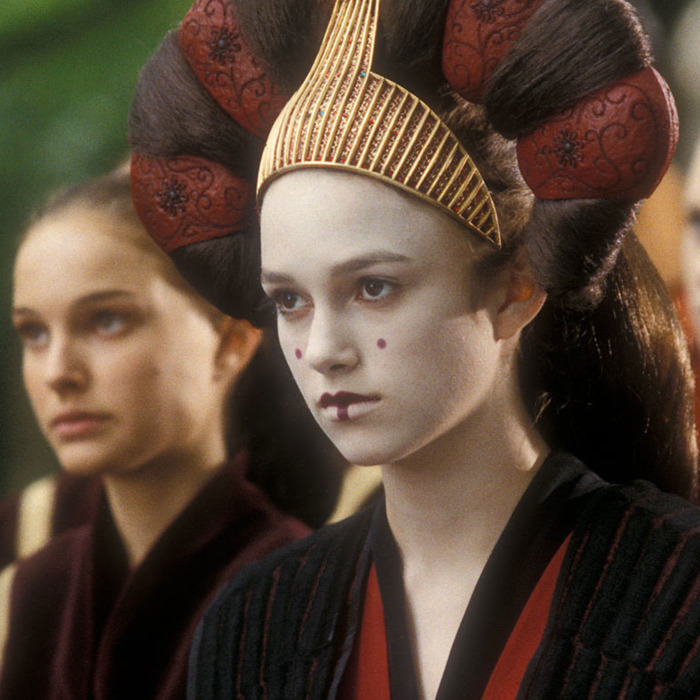 Her cadre of handmaidens made a brief appearance in Attack of the Clones, but by Revenge of the Sith she was alone and left to watch her world crumble around her without any apparent support. She ends the trilogy by giving birth to the next generation’s heroes and then, at the age of twenty-seven, loses her will to live and dies of a broken heart. Three years ago I wrote an article advocating for a Padmé novel. For far too long she had only really existed as an extension of Anakin and wasn’t given a chance to shine on her own. As arguably the main character of The Phantom Menace and (inarguably) a key figure in the story of the final days of the Republic, she deserved a better legacy than only being remembered as the object of Anakin’s fears and an indirect reason for his turn to the dark side. More importantly, for a character who started with so strong a story and so interesting a backstory, it was a shame that her movie potential was wasted with bad writing. So to finally have her given a voice after getting the short end of the stick for so long is incredibly meaningful in a way that’s difficult to put into words. Before Rey, before Ahsoka, it was Padmé who brought a whole new generation of girls and women into Star Wars fandom. She had a quiet strength to her; she was handy with her words and her blaster. Whole sites rose to catalogue her outfits and to discuss her handmaidens, who were one of the original fandom girl gangs before the concept of “girl gang” was mainstream the way it is now. She was also unashamedly feminine, with her seemingly neverending parade of elaborate gowns and intricate headpieces. It’s no wonder her fans are fiercely devoted, despite the scarcity of stories focused on her. But finally, E.K. Johnston is giving us the story Padmé (and thus, her fans) has long deserved. Not only is Padmé finally getting to be the star of her own story after twenty years, but it’s a book entirely about her. Not her as one half of Padmé-and-Anakin, but her, as her own individual person with a life, goals and relationships of her own. This was clearly a book written with great love and reverence for Padmé and for that generation of women who came of age with the prequels. E.K. Johnston’s attention to detail is impressive as she pulls references from books like The Queen’s Amulet and Queen Amidala’s Episode I Journal as well as all manner of stories from the current canon. Her love for Padmé and the handmaidens comes through in every word to create a richly detailed and sentimental story. Queen’s Shadow is not overly concerned with a linear plot. Rather, the focus is on the characters and their relationships with each other and their changing world. And that’s the right move for a prequel novel; we know where Padmé’s story is headed so here the journey is more important than the destination. We see Padmé as a vulnerable young woman, leaving the role of Queen of Naboo to take up a position as galactic senator on Coruscant. Her cadre of queenly handmaidens, her dearest and closest friends, are going their separate ways to pursue their own projects, thus leaving Padmé to navigate an unfamiliar political arena with a new group of people to lean on. She eventually finds success, as we already know she will, but her struggle to find her footing and discover who she is as a person (and, more importantly, who she wants to be) outside of the stately trappings demanded by royalty is no less emotional for its foregone conclusion. Padmé is granted an interiority in a way she never has before, in canon or Legends. But perhaps more important is this: we actually get to see a woman have deep emotional friendships with other women. This book is truly a celebration of women and the relationships they have with each other, as well as championing collaboration and working together for a better whole. Padmé and her handmaidens have been a part of Star Wars lore for two decades now, but outside of a couple middle grade tie-in novels released with The Phantom Menace that bond hasn’t been deeply explored. Here, they are all given distinct personalities, goals and dreams. They are accomplished in their own right as politicians, slicers, artists, musicians and caregivers. And while the franchise as a whole has made great strides in recent years to put stories about women front and center, those women have still primarily existed in a world where they are surrounded entirely by men. To the best of my knowledge, there has not been a story in the Star Wars franchise that focuses so deeply on women. We get moments between Padmé and all her handmaidens as well as between the individual handmaidens themselves. It’s wonderful to see how they operate and all the wild things they are trained for, but even better are the scenes where they are simply relaxing and we see all the beats of their friendships as simple teenage girls. Even better, E.K. Johnston takes the time to flesh out the mentorship between Padmé and Mon Mothma, the professional respect she develops for Mina Bonteri, and Padmé’s friendship with Breha Organa. It’s particularly that last one that I found quite touching, as we see both women muse on royalty, family and legacy and it’s made all the more sentimental due to knowing the connection the two women will share via Leia. However, Padmé’s relationship with Sabé is the heart and soul of the novel. Fans of the prequels already know that Padmé and Sabé are best friends, but Queen’s Shadow shows us the bond is so much deeper than that. To borrow a reference from another well-known space franchise, it’s more akin to the Vulcan concept of t’hy’la, which can be translated alternately as “friend” “brother” or “lover” though fandom often accepts “soulmate” or “life-long companion” as acceptable definitions as well (for context, the term was originally coined by Gene Roddenberry to describe the relationship between Kirk and Spock). It’s the word that immediately came to mind when reading this book, as Sabé and Padmé have a bond that truly supersedes all others and reaches across planets and, indeed, even death. Johnston expertly explores the delicate balance the two tread between Sabé’s willingness to give her life for Padmé with no hesitation and Padmé being conscious of not abusing that loyalty. Their time as decoy-and-queen has melded them into something like two halves of the same heart, which makes the gut punch of the epilogue hit all the harder. Queen’s Shadow is a book that has been twenty years in the making. Not only does it give a long-overdue voice to one of the franchise’s most forgotten main characters, but it is an earnestly heartfelt story about women who love one another. It will be impossible to watch the prequel movies and not think of Padmé’s struggles to establish herself in the Senate or the happy times she shared at the lake house with her friends. Furthermore, Queen’s Shadow is uniquely feminist in how it deals with powerful women building each other up to make a positive difference in their worlds, even as they may doubt their abilities or face mockery for how they don the trappings of femininity. But the final message here is clear: you underestimate young women at your own peril. For a character as fiercely devoted to social justice as Padmé Amidala, and for a whole group of women who were inspired by her, I cannot imagine a better banner to wave.